For those of us from a Judeo-Christian heritage, it is sometimes possible to believe that suffering is worthwhile; a way of paying for past sins. In this light, the age of austerity in which we supposedly live has a sort of redemptive quality. Grit our teeth, and we will come out the other side, purified and ready for robust economic recovery. However, the prayer that policy makers have been uttering is that of St Augustine: make me virtuous, but not yet. After five years, we are in a worse place than when we started. 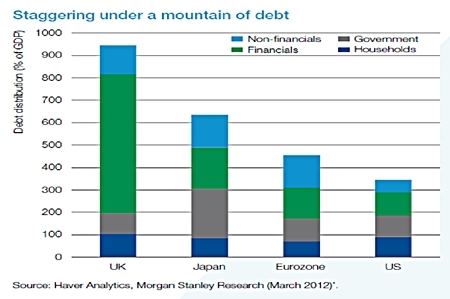 One would have thought that the recent deleveraging should have caused debt ratios to collapse. Yet, after the financial maelstrom of the last five years, debt ballooned to a weighted average of 417 percent of GDP from 381 percent in June 2007 in the eleven economies most under the market microscope. Strikingly, in each of Canada, Germany, Greece, France, Ireland, Italy, Japan, Spain, Portugal, the UK and the US, the ratio of total debt to GDP is now higher than it was in 2007. There are variations, and it is notable that debt in the US has increased the least, from 332 percent of GDP five years ago to 340 percent today (Goldman Sachs, Federal Reserve Z1 Report) - although we should not draw too much consolation from that, as the statistics do not include social entitlements such as Medicare or Social Security. Add in these ‘off-balance sheet’ items, and the ratios would look a great deal worse. As can be seen from the chart on this page, deleveraging is proving impossible to execute. The world is still staggering under a mountain of debt, the costs of which extinguish the ‘animal spirits’ which ought, by now, to be coming to the rescue. Based on this analysis, we can make five predictions. First, as deleveraging has not even started yet, the real crisis of the world economy has not begun either. All the perceived unpleasantness of the past few years is merely a warm-up act for the greater crisis still to come. The requirement to get debt levels down is as pronounced as ever in the euro-zone, particularly in southern Europe, but also in the US and Japan. Second, it will take a minimum of 15 years or so for the economy to reach escape velocity and attain a level consistent with healthy growth scenarios. This is because debt levels need to come down by at least 150 percent of GDP in most countries. History suggests you cannot reduce debt by more than ten percentage points a year, without unleashing major social and political dislocation. Third, when we do finally start cutting our debt, the economic impact will be massive. Countries like Japan and the US need to increase their primary balance by more than 10 points of GDP, in order to stabilise the ratio of public debt to GDP to 2007 levels. Considering negative feedback loops between deficit cuts and growth, each stands to lose more than 20 percent of GDP against trend. And this does not account for the required private deleveraging. The precise level of economic devastation is a function of the so-called multiplier, which measures the impact of spending reduction on economic growth. In a recent World Economic Outlook, the International Monetary Fund (IMF) calculated recently that under current circumstances the multiplier can be as high as two: every dollar cut from the deficit will lead to a two dollar reduction in GDP. The multiplier is as much as four times higher than in pre-2008 conditions. Fourth, risky assets are set to perform badly for a long period of time. Levels of corporate profits are highly correlated with changes in leverage: reduce debt to meaningful levels and profitability will fall. Current levels of valuation in equity markets are therefore unsustainable over the medium term. Besides, the equity risk premium on major indices, such as the S&P 500, is at historically low levels. This needs to rise dramatically in order to compensate investors for multiple market risks, ranging from sovereign default to inflation, deflation and geopolitics. The fifth and final point is that there is no magic bullet. In the past, policy makers had various instruments to cushion the impact of measures taken to stabilise debt levels. For example, they could cut interest rates or allow their exchange rates to fall, leading to export-driven recovery. But in an era of low or zero interest rates, with most countries competing to devalue their currencies, such policy tools have lost effectiveness, hence the high multiplier. Even inflation, long touted as a back door solution to debt reduction, will not help. The onset of inflation would send bond yields sky high, compounding the costs of servicing debt and killing off any recovery. And ‘off-balance sheet’ entitlements, the biggest item that needs trimming, are inflation adjusted. How do asset classes rank on the totem pole if this scenario plays out? Bonds of solvent governments and corporates should do well in a deflationary environment where rates are kept lower for longer; stocks should revert to new lows; and currencies of highly leveraged, growth-sensitive markets should be sold. The possibility of making money on property is now much more reliant on where in the world it is. As for alternative investments, such as commodities, it depends on what you have gone for and where it is in its own economic cycle. In the words of an old Austrian adage, the situation is hopeless, but not serious. It is not serious, as politicians simply fail to acknowledge the elephant in the room, namely leverage, introducing instead a succession of policy gimmicks. It is hopeless, in that virtue is not likely to be rewarded for a generation. But money can still be made - just remain liquid!